Of course, I still scraped out the almond filling and ate it, since that was why I was making them in the first place. Recently, I read about this contest to come up with a recipe using chocolate and at least one from a list of “adventure ingredients”. 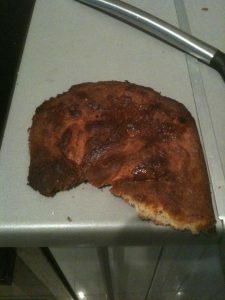 This is my second trial recipe – the first one needs a bit more finesse before I can post it. Among the adventure ingredients are black sesame seeds, matcha (green tea) powder, and coconut milk. 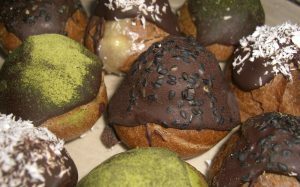 These cream puffs use chocolate choux with one of three fillings: black sesame cream, green tea and coconut. 1. In a medium bowl, whisk together the cocoa powder and flour. In a saucepan over medium-high heat, mix together the milk, water, butter and salt. Bring to a full boil. When the butter is melted, remove the pan from the heat, add all of the flour-cocoa mixture and stir with a wooden spoon until blended. This may require some powerful stirring. Return the pan to medium heat and continue to stir until the mixture forms a ball. Remove from the heat and let cool 3-4 mins, or to 140o on an instant-read thermometer. 5. Remove from the oven and immediately prick the side of each puff with a sharp knife. Return to the oven, leave the door open and let the pastries dry for 10-15 mins. Move to a wire rack and allow to cool completely before filling. 1. [SF: Preheat the oven to 375oF. Spread the sesame seeds on a baking sheet and toast 7-8 mins.] In a medium saucepan, heat the milk [CF: and coconut milk] with the [SF: toasted sesame seeds][GTF: matcha powder] until just before it boils. Remove from heat [SF: and strain out the sesame seeds]. 3. Cook over medium-low heat, whisking constantly to prevent curdling or uneven cooking, until the mixture comes to a boil and thickens, about 3 mins. Continue to whisk and cook for about another minute. Pour through a fine-mesh sieve into a clean bowl and stir in the butter until it is melted and smooth, [SF: then stir in the sesame seeds from earlier][CF: add in the unsweetened coconut]. 5. Fit a pasty bag with a small tip (but large enough to allow the sesame seeds through) and fill the back with the chilled creme patissiere. Make a small incision in a puff and fill with the cream. Repeat until all puffs are complete. 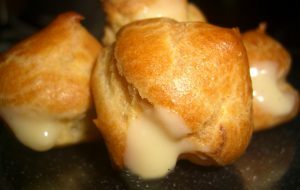 Author JillianPosted on 02/10/2008 22/09/2018 Categories PastryLeave a comment on Cream Puffs!